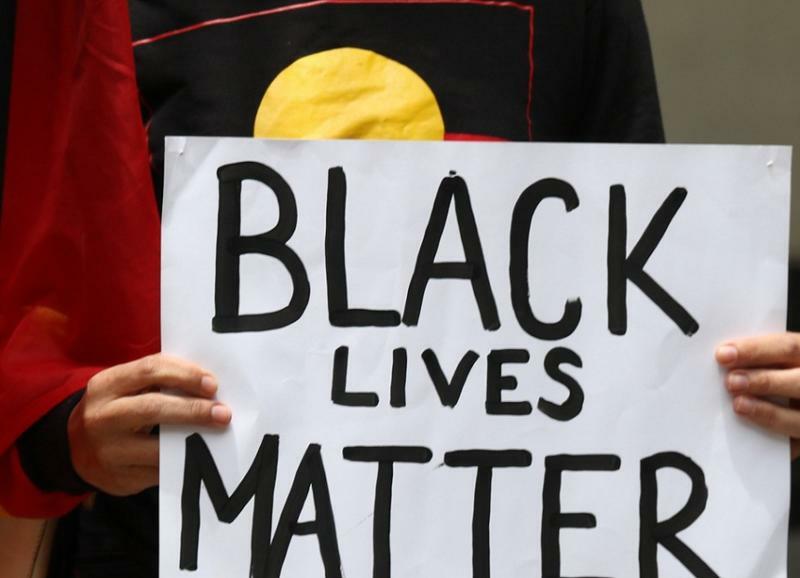 Root causes of injustice for Indigenous Australians remain ignored decades after a watershed inquiry pointed a way forward, writes Jack Latimore. Twenty-five years ago, the final report of the Royal Commission into Aboriginal Deaths in Custody landed with a resounding thud, containing within its many pages 330 recommendations for putting right an injustice that had long been allowed to fester within the nation’s criminal justice system. The report was the culmination of a $40 million, three-year probe into the cause and nature of the deaths of 99 Indigenous Australians between January 1980 and May 1989. And a focus of the commission’s findings that were presented on this day in 1991 was what might have been done to prevent them. Fast forward to 2016 and, shamefully, the bulk of those carefully considered recommendations continue to be ignored despite their searing — and continuing — relevance. Indigenous Australians are 15 times more likely to be incarcerated than white Australians. And the figure is higher again in the Northern Territory, and more alarming per capita in Western Australia, where the imprisonment rate for Indigenous Australians (1 in 20) is only slightly below the imprisonment rate of African-Americans (1 in 15) in US prisons. Most of the recommendations were straightforward enough, such as recommendation 161, which advised police and prison officers to seek medical attention immediately should there be any doubt about a detainee’s health. Other recommendations were slightly more abstruse, seeking to facilitate Indigenous self-empowerment in order to redress the systemic marginalisation of First Nations people by the Commonwealth’s dominant institutions. Yet the incarceration of Indigenous Australians has climbed 13 per cent since the release of the inquiry’s final report. Today, an Indigenous population comprising less than 3 per cent of the Australian population accounts for more than one-in-four adults in prison. And 48 per cent of all Australians incarcerated when including Indigenous children in juvenile detention. In 2016, Indigenous Australians are 15 times more likely to be incarcerated than white Australians. And the figure is higher again in the Northern Territory, and more alarming per capita in Western Australia, where the imprisonment rate for Indigenous Australians (1 in 20) is only slightly below the imprisonment rate of African-Americans (1 in 15) in US prisons. Australia’s government and legal institutions preside over this disproportionate representation. However, that more Indigenous people being in custody is likely to result in more Indigenous deaths in custody would appear to be beyond the realm of their comprehension. Or that the authorities reponsible are fully aware, but plainly indifferent. Despite the Royal Commission’s recommendations, particularly recommendations 87 and 92 which state that Indigenous people – like non-indigenous Australians – should only be arrested when no other way exists for dealing with a problem, and that custodial detention should only be a last resort, Indigenous Australians are being imprisoned now more than ever. The high numbers are due to varied factors, but primary among them are policies such as mandatory sentencing – a policy based on a US model and introduced into the Australian context by former WA premier Carmen Lawrence – and the so-called “paperless arrests”, introduced into the Northern Territory in 2014 to free up policing resources. Of the 2000 people who have been detained via paperless arrests, close to 80 per cent were Indigenous. These arrests can be triggered by such astonishingly minor offences as swearing, making noise or having an untidy front yard. In November 2015 the High Court of Australia ruled that paperless arrest laws were valid. Other notable minor offences contributing to the high figures of Indigenous incarceration across the nation include imprisonment for unpaid fines and for not attending court hearings. In myriad cases, this was found to be due to factors as simple as not having received fines and summons notices in the post. These are the often-aired statistics that led former Prime Minister Kevin Rudd to acknowledge early last year that Australia was experiencing an Indigenous incarceration epidemic. But a Commonwealth-backed state of emergency is unlikely to be declared. Racialised punishment continues. And the death count climbs. Most recent is the case of the late Ms Dhu, whose first name cannot be used for cultural reasons. A coronial inquest into the death of Ms Dhu, a 22-year-old Yamatji woman, who died in a Port Hedland police station in August 2014, heard last month that she had been incarcerated for $3600 in unpaid fines. The inquest was told that her death while in police custody was due to septicaemia and pneumonia. Ms Dhu had an infected broken rib, sustained in a domestic violence incident prior to her detention. She was in pain and made this known to police only to be dismissed as a “junkie coming off drugs”, who was “faking it or putting it on”. Eventually, police relented and Ms Dhu was handcuffed and carried to a divisional van to be transported a short distance to hospital, where she died soon after. The inquest was provided with CC TV footage of Ms Dhu’s last hours in custody, some of which includes vision of her being “dragged like a carcass” out of the watch-house, according to a leading human rights advocate, and “dumped” in the rear of the police vehicle. 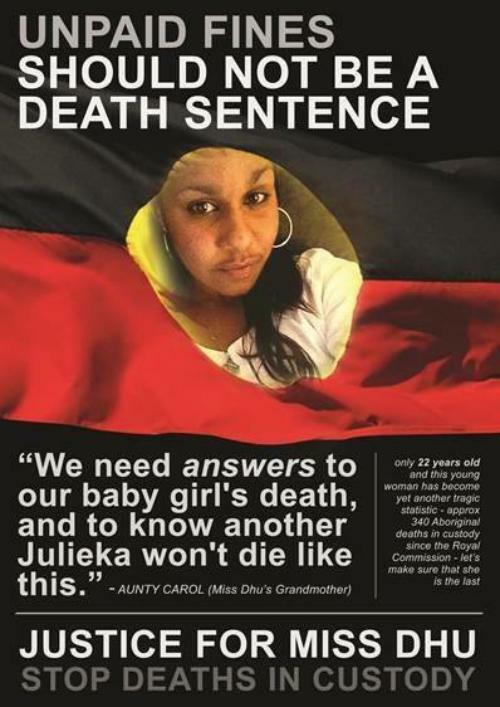 After initially requesting that the footage be suppressed, Ms Dhu’s family have since requested the inquest make the video available to the public to force action to address the ongoing issue of Indigenous deaths in custody. The coroner has refused to do so. The tragic case of Ms Dhu is by no means an isolated one. The death of Indigenous man Shaun Coolwell in October last year occurred on the fourth anniversary of the death in custody of his brother, Bradley Coolwell. Shaun was at his home in Logan, QLD when he became distressed and self harmed. An ambulance arrived, accompanied by up to a dozen police cars. The police arrested and handcuffed Coolwell before he received any medical attention. Indigenous leader Sam Watson, speaking on behalf of the family, later told reporters how police had manhandled Mr Coolwell. “Shaun was smashed down onto the floor and they used their knees and shoulders to hold him and handcuffed his hands behind his back,” Mr Watson told the Brisbane Times. Mr Coolwell later died in hospital. Richard Frankland, who was the Victorian Aboriginal liaison officer for the Royal Commission into Aboriginal Deaths in Custody from 1988, was directly involved in investigating some of the 99 deaths included in the inquiry’s terms of reference and talked to many families of the deceased. Mr Frankland went on to write and direct the documentary ‘Who Killed Malcolm Smith’ in 1992, and the short feature film ‘No Way To Forget’ in 1996. Both of those works, and a 2001 stage play titled ‘Conversation With The Dead’, reflect his experiences working on the road for the national inquiry. He is not surprised by the overwhelming national failure to implement its key recommendations. “It’s what you expect. As a nation, we blame the victim,” he says. “We’re incarcerated at a rate that is just disgusting. As a nation we don’t rehabilitate, we punish. ► This is an edited version of a story that first appeared in Overland magazine.